On a decrepit block of Broadway in downtown Los Angeles, hidden behind a dilapidated, aging façade, lies the ghost of a palatial dining hall filled with towering redwoods and a gurgling stream. 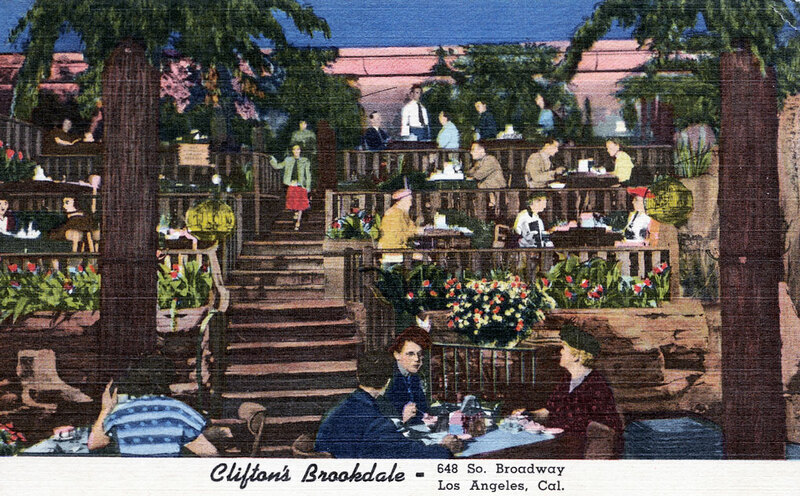 Known as Clifton’s Brookdale Cafeteria, this terraced wonderland recalls a different time, when cafeterias were classy and downtown living was tops. Against all odds, the Brookdale outlasted attacks from notorious L.A. mobsters and decades of neighborhood decline. Over the last few years, Clifton’s has been closed while staging its comeback, finally being restored to its original Depression-era grandeur. As the last jewel of a 20th-century cafeteria empire, the Brookdale’s unique vision of paradise has earned a spot in the hearts of many longtime Angelenos. Real-estate developer and entrepreneur Andrew Meieran, the restaurant’s current owner, says he was first drawn to the idea of rehabilitating Clifton’s almost a decade ago, enticed by its quirkiness and his disbelief that it was still in operation. “I just became fascinated by it. It’s this wonderful link to old L.A.,” he says. Top: The exterior of the Brookdale cafeteria during its early years. Above: The Brookdale’s main dining room in all its woodland glory. Clifford and Nelda Clinton opened their first restaurant in 1931, on the site of a run-down Boos Brothers cafeteria at 618 Olive Street, naming it Clifton’s by combining Clifford’s two names. “It was during the height of the Great Depression when we came to Los Angeles from Berkeley,” explains Don Clinton, Clifford Clinton’s son. A recent view of the Brookdale interior, including a neon cross on the roof of its small chapel. Photo courtesy Jesse Monsour. In an era when profit-oriented businesses often attempt to cast themselves as philanthropic ventures (see the conceit of certain internet entrepreneurs, or delusional luxury retailers like Restoration Hardware), Clifton’s original mission comes as a breath of fresh air. At the Clintons’ second restaurant, the Penny Caveteria—named for its basement-level locale—meals cost only one cent. They were free if you used one of Clifton’s redeemable tickets, which were frequently given out to the homeless. Long before the Civil Rights movement allowed black Americans to freely patronize white-run establishments, Clifton’s restaurants were integrated. In response to a complaint about his progressive policy, Clinton wrote in his weekly newsletter, “If colored skin is a passport to death for our liberties, then it is a passport to Clifton’s.” Regardless of income or skin color, Clinton wanted everyone who ate at his restaurants to be completely satisfied, so the phrase “Dine free unless delighted” was printed on every check. Though many patrons ate for free, enough customers gave significantly more than they were asked to keep the business afloat. 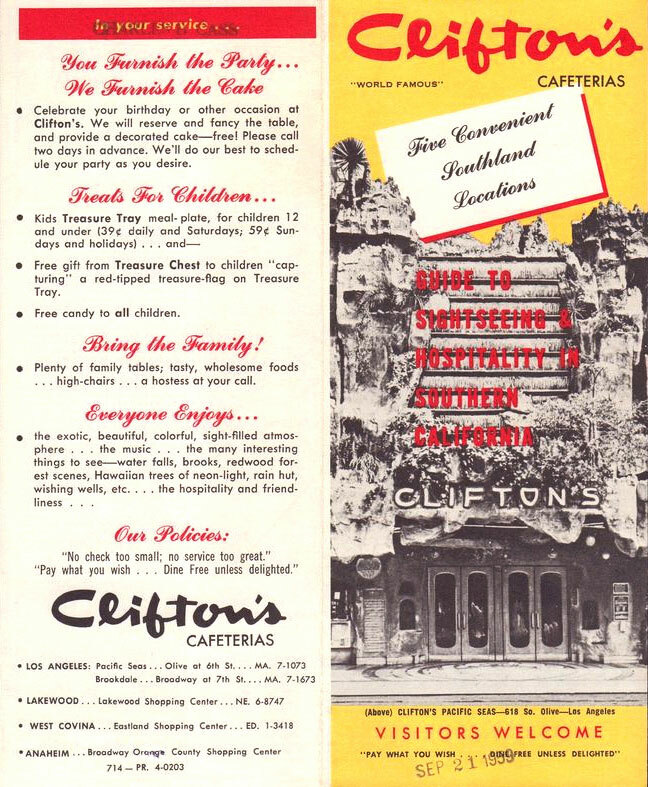 A brochure from the Clifton’s chain in 1959 highlights the company’s signature ethos. “The Clintons were true missionaries, in that they wanted to show by deed and example, and did a fantastic job with it,” says Meieran. “They offered self-improvement classes; they provided a barber and ways to clean up if you couldn’t afford them yourself. It was all about the community and providing help, as opposed to just making money. That was never the goal.” Working with local doctors and pharmacists, the company created a fully paid medical plan for its staff. After surgery or a hospital stay, recuperation was provided in the sprawling Clinton family home in the Los Feliz neighborhood of L.A. Eventually, one of the Caveteria’s regular patrons offered Clinton the chance to open a location in his building at 648 South Broadway. In 1935, this spot would become the Brookdale, the largest cafeteria in the world. Only a few years after opening the Brookdale, the Clintons redesigned the space as a lavish distraction from the country’s financial hardships, with an over-the-top themed environment that made it one of L.A.’s new hotspots. 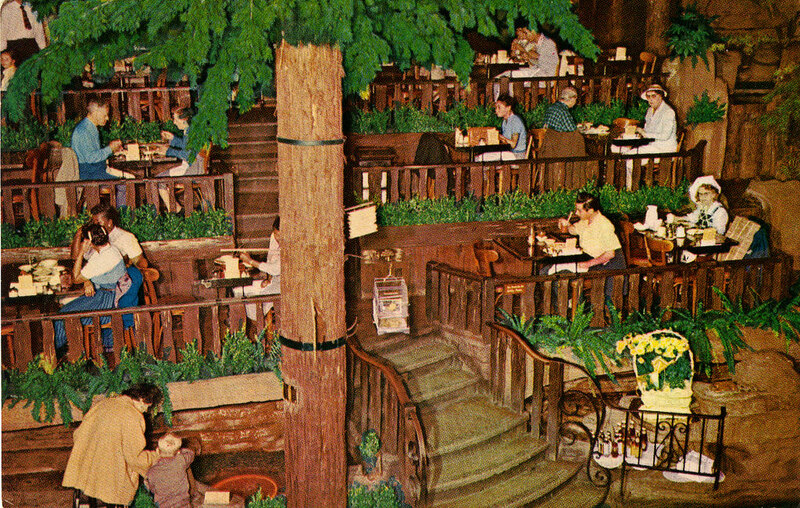 Clifton’s forested dining room, left, was inspired by the grand hall at the Brookdale Lodge in Brookdale, California, where Clinton spent time as a boy. Today, it’s hard to imagine cafeterias as groundbreaking, since they’re now known for drawing the senior-citizen crowd with bland, overcooked food and hospital-style furnishings. But in the 1930s, cafeteria dining was a completely modern innovation, representing the freshest fare available. “The cafeteria was a very European idea, and it grew out of the Scandinavian smorgasbord, brought to the United States in the 1880s,” explains Meieran. “Cafeterias originally served top-end, high-quality food because their money was spent on the product instead of the service. Since people were serving themselves, they didn’t have to pay the wait staff as much, so they could spend more money on food. 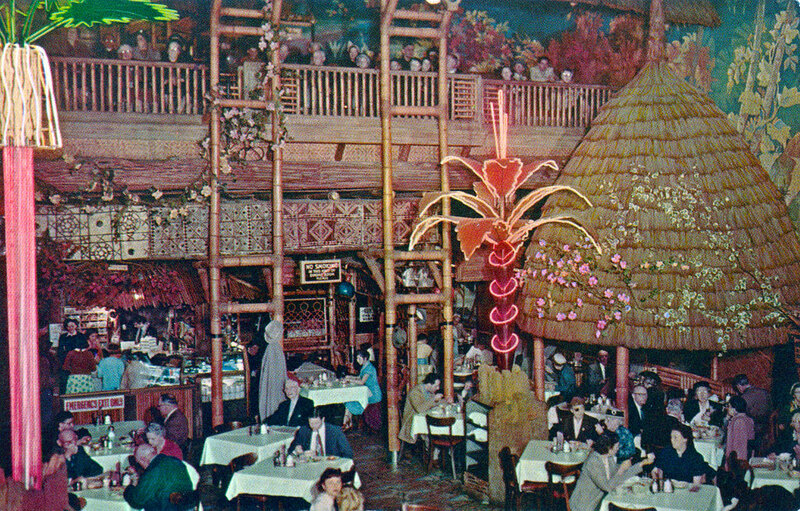 The flashy décor at Clifton’s Pacific Seas restaurant included neon palms. “Cafeterias became the original fast food,” he adds, “and they allowed people to time their days better, instead of worrying if they’d be served quickly at a normal restaurant. It was the first real convenience food. The other big factor was that you could serve many more people: At its height, Clifton’s Brookdale location could seat up to 15,000 people a day. No other restaurant on Earth could do that.” Besides their forested main dining hall, the Brookdale also included a tiny, two-seat chapel for spiritual reflecting plus a separate top floor with a more traditional, red-and-white interior. The Brookdale was such a success, the Clintons decided to give their original restaurant a makeover, transforming it into the Pacific Seas in 1939—a tropical wonderland filled with waterfalls, palm trees, neon lights, tiki furnishings, and a Rain Room, where a fake thunderstorm occurred every 20 minutes. Clinton called the restaurant “a poor man’s nightclub.” Never one to overlook their religious commitments, the Clintons paid homage to the biblical Garden of Gethsemane in a small basement room. Clifton’s over-the-top interiors also had influential admirers. “Welton Beckett, who designed the original Brookdale, was best friends with Walt Disney,” says Meieran. “Several people who knew him said that Disney went to Clifton’s and was inspired by the design. 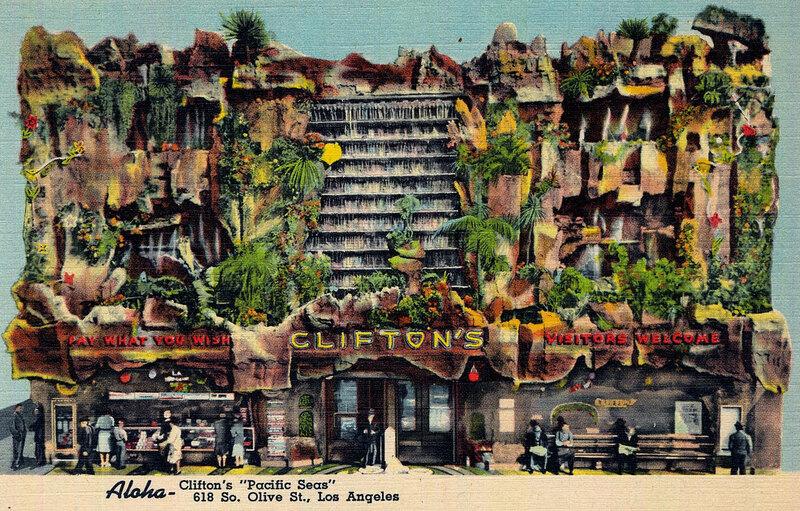 There had already been fantasy architecture, but Clifton’s took it to a new level.” Disneyland, the pinnacle of fantasy environments, wouldn’t open for another two decades. A late-1940s postcard shows the waterfall-facade of Clinton’s Pacific Seas restaurant with its iconic signage. Even as Clifton’s was succeeding via the family’s idealistic efforts, the city of Los Angeles was awash with corruption, particularly following the election of Mayor Frank Shaw in 1933. Instead of taking a cut and turning a blind eye to organized crime as previous politicians had, Shaw streamlined the city’s mob rackets, thereby increasing his own payoff. Along with his brother, whom he appointed secretary, Shaw began selling off city appointments and set the going bribe rates for illegal activities like prostitution and gambling. Clifford Clinton never had his sights set on politics, but in 1936, a city supervisor asked for his opinion on the food-service problems at L.A. County General Hospital. True to his nature, Clinton performed a detailed inquiry that revealed huge misappropriations, resulting in the dismissal of the hospital director. The following year, Clinton joined the county Grand Jury as chairman of a committee to investigate vice. Using his customer base as a huge insider network, Clinton tipped the jury off to L.A.’s widespread corruption, demanding a thorough investigation. Only when they ignored his request did Clinton realize how deep the corruption really ran. 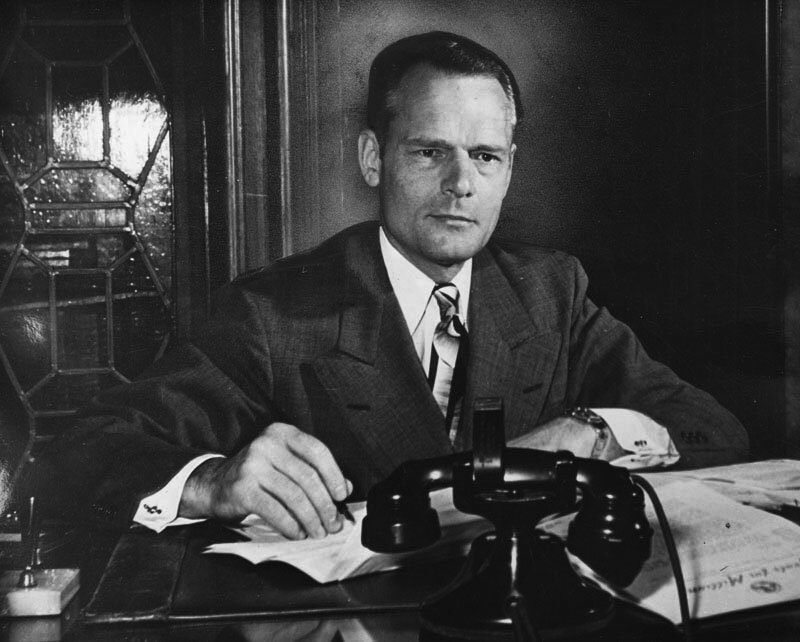 Clifford Clinton in his office, circa 1947. Not only was the mayor’s office in on these shady dealings, but the local news conglomerate, controlled by the Chandler family of the “Los Angeles Times,” plus District Attorney Buron Fitts and Chief of Police James E. Davis were all part of the plot. People who attempted to expose their nefarious behavior were blackmailed, or sometimes just murdered. Yet Clinton didn’t back down. Instead, he filed a minority complaint to the grand jury and established the Citizens Independent Vice Investigating Committee (CIVIC). Clinton soon had evidence of nearly 600 brothels, 1,800 bookies, and 300 gambling houses. In response, his businesses were suddenly attacked: Notices for phony sanitation violations and false taxes were delivered, new permits were denied, stink bombs were left in kitchens and bathrooms, food-poisoning complaints poured in, and buses full of supposedly “undesirable” customers were dropped off at the cafeterias’ entrances. The “Los Angeles Times” coverage of Harry Raymond’s car bombing in January of 1938. Luckily, nobody was hurt, but only a few months later, a car-bomb critically injured former police chief Harry Raymond, who was working as an investigator for Clinton’s CIVIC group. 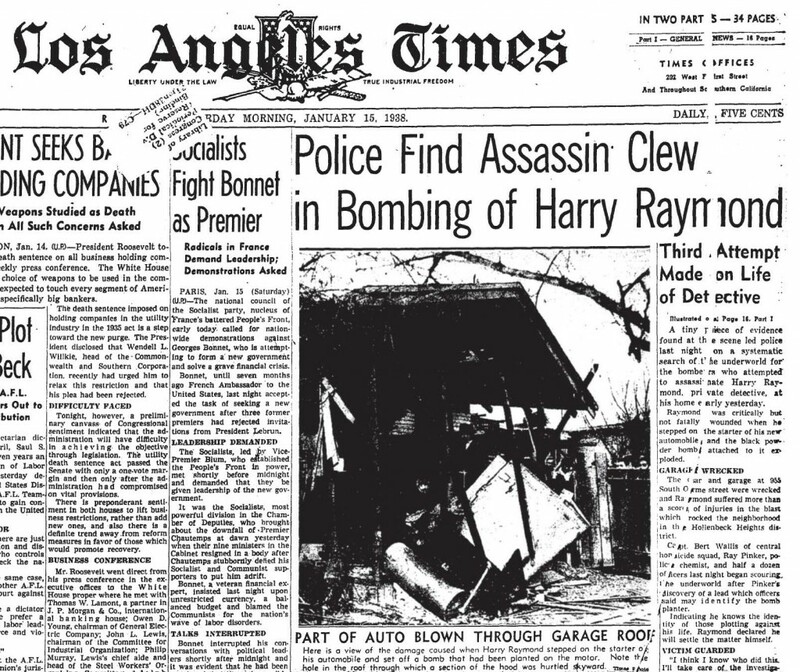 Shortly after, the director of LAPD’s Special Intelligence Unit was arrested for the crime when bomb parts and other evidence were found at his home. 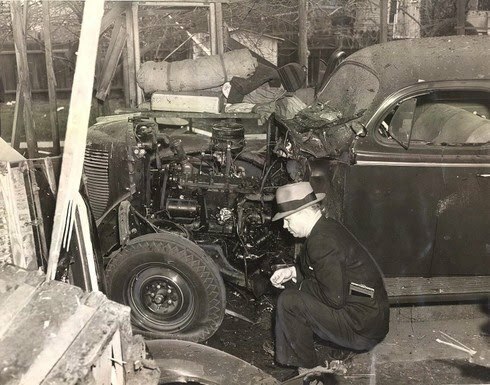 Raymond’s car after the bombing. Via latimes.com. Clinton still wanted to take down Shaw, so he pushed for a mayoral recall. Despite being blocked from all major news outlets, he found a small radio station that would broadcast CIVIC’s findings four times a day. 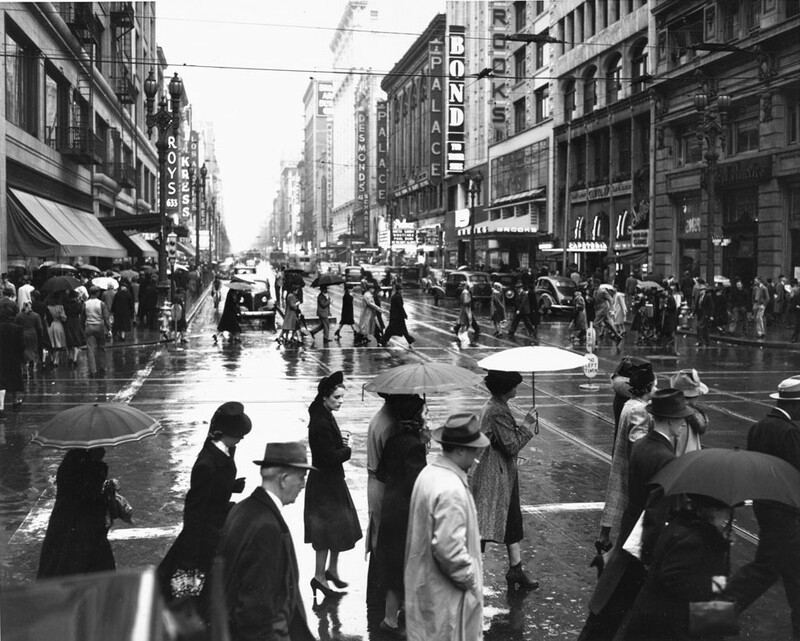 “My dad finally initiated a recall movement, the first recall of a big-city mayor in America. It made a lot of ripples,” says Don. Though mob bosses tried everything to slow the campaign, Clinton gathered the necessary signatures, and the city overwhelmingly supported his new candidate, Judge Fletcher Bowron, who got nearly double the votes Shaw did. After winning his war against the Shaw regime, Clinton began working with Dr. Henry Borsook, a biochemist at Caltech, to create a cheap meal supplement to fight hunger. “He went to Caltech in the late ’30s to develop this food product using a derivative from soybeans,” says Don. Borsook’s research led to Multi-Purpose Food (MPF), a high-protein supplement that cost only three cents per meal. Clinton went on to found Meals for Millions in 1946, which eventually produced and distributed millions of pounds of MPF to relief agencies around the globe. 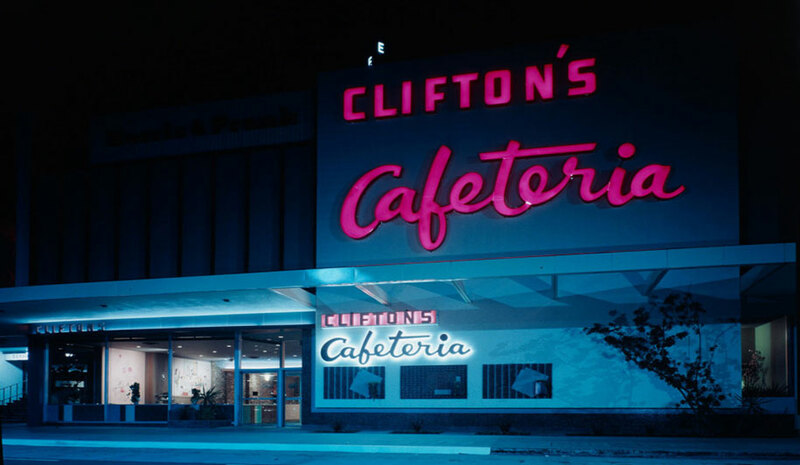 The Clifton’s Cafeteria in this West Covina, California, shopping center featured Googie-style signage. By the late 1940s, Don had taken over the Clifton’s business with his brother, Edmond, and his sister, Jean, and they continued expanding their cafeteria empire to 11 different locations in Southern California area. As Meieran explains, the décor was no longer limited to kitsch. “One was a sort of European garden, and another one was an Etruscan villa-esque place,” says Meieran. 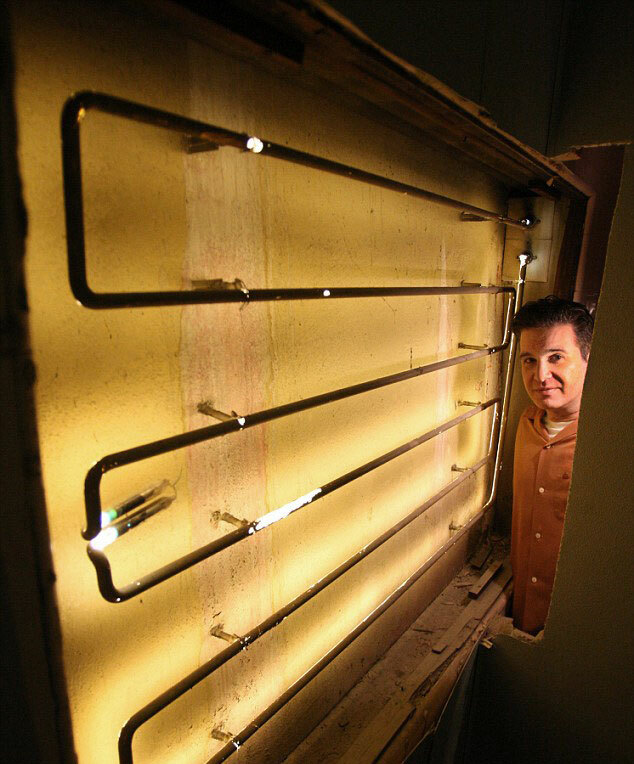 Andrew Meieran surveys the neon tubing hidden in a basement wall. Via latimes.com. The Brookdale building was originally constructed in 1904 as a furniture store, signs of which contractors discovered during the most recent renovation, like a column painted with directions to different store departments. Though the restaurant has undergone alterations every few decades over the last 80 years, many interior elements remain virtually unchanged. In fact, Meieran’s crew discovered a neon light sealed within the walls, likely powered continuously since 1935. “It was embedded like 8 inches into the wall, and closed in with a piece of plywood and then sheetrock and tile,” says Meieran. 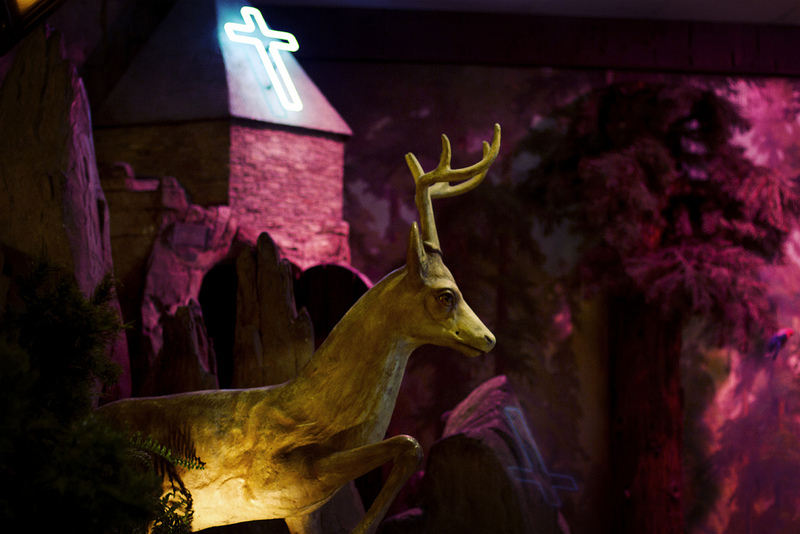 The six rows of neon tubing were originally installed to backlight a painted woodland scene in the basement restroom, and then accidentally walled-over in 1949 when part of the space was converted to a storage area. A postcard image of the Clifton’s Brookdale interior, circa 1940s. During its prime, the Brookdale was located in the busiest neighborhood of the biggest boomtown on the West Coast, but L.A.’s vast suburban expansion and crumbling transit infrastructure hit its downtown hard. “From the mid ’50s, it started declining, and by the time you get to roughly 1965, development was in full retreat,” Meieran says. “L.A. had an unlimited amount of space at the time: You could build all the way to the beaches in every direction, and to the desert in the other side. And you had all these different centers—places like Century City and parts of Santa Monica and Beverly Hills were booming. The bustling neighborhood around Clifton’s Brookdale (second building from the right), seen in its 1930s heyday. Left, a lighted menu board displays standard Brookdale fare, and right, the building’s exterior as it looked post-1960. Photos courtesy J. Eric Lynxwiler. Left, the Brookdale’s original facade was revealed during renovations in 2012. Photo courtesy J. Eric Lynxwiler. Right, most recent diners at the Brookdale had been lifelong fans. Photo courtesy Jesse Monsour. As for the menu, Meieran calls it a “contemporized version of classic cafeteria fare.” In addition to standard comfort foods like macaroni and cheese, Meieran wants the broad nature of his cafeteria’s menu to reflect the eclectic cultures that make up Los Angeles, ranging from Chinese food to Mexican dishes. That should go over well with the Brookdale’s longtime customers, as Don remembers enchiladas being a top seller, moving more than 1,000 orders during an average lunchtime. 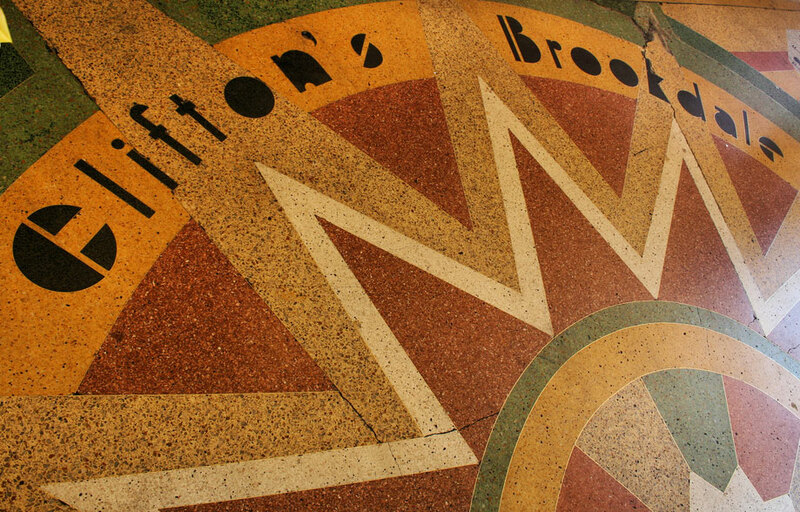 The Brookdale’s colorful terrazzo sidewalk. Photo courtesy Chris Jepsen. I wanted to know if there are any records or photos of the chiefs that worked at the Clifton’s on Broadway in DTLA. I was told that my Great Grandfather Thomas Sanchez was one of the long time chiefs that worked there in the 4o’s. Looking forward to the new Grand Opening. ………Great article, Clifton’s must have inspired many restaurants during his time. Most shocking is to see how hard he fought corruption, unlike the clintons of today. Looking forward to Clifton’s returning to the #DTLA landscape with all the food “upfront and personal” for a new generation! Cheers! Very good to learn of both Clifton’s entrepreneurship and his generosity in passing his good fortune on to feed those who could not afford. Very admirable to see his returning some of what he earned from the people to the people and doing his best to help through public service as well. One of the Angels of Los Angeles. Well done, Mr. Oatman-Stanford! I’ve been excitedly awaiting the reopening! Is there any plan for publishing a cookbook from the old recipes? How about republishing the gorgeous old postcards, or publishing new ones? I have eaten here many times starting in the 1940’s. (Maybe before that but the 40’s is what I remember) It was always a must when we took the 5 car from Inglewood to LA. Shopping then to Clifton’s. The food was wonderful and we always ate more than we should. I didn’t know about the other Clifton’s but for me there will only be ONE Clifton’s and that is the one in downtown LA. What great memories. This is wonderful. I’ve got to figure a way to work it into my vintage novel. I love this and would love to go there. The terrazzo still looks great. I will share on my FB and twitter! Wonderful and GREAT site! Best of luck–cannot wait to patronize the new iteration of Clifton’s. This story was great. It reminded me of another cafeteria/city institution, Sholl’s in Washington DC. Sholl’s was not an imaginative place to eat, but its owners were as philanthropically- and community-minded as the Clintons (minus car bombs!). loved this place as a kid…both of them! went to the one in West Covina and the one downtown (late ’60s) – it is so true – the whole staff was warm, kind and caring despite the huge crowds they catered to – they always gave you a personal welcome – here’s hoping the new Cliftons will also be open at lunchtime and not just as a nightclub? Great article, but nothing about the role of Mrs. Clinton in the kitchen — her recipes, her involement in the kitchen even as she aged. I can’t wait till you open so we can go back. I have been going here since I was a little girl, my grandmother and I had lunch her once a week I can’t wait to visit when it opens. I introduced my husband to this place when we got together and he loves the place as well. My family will be there when you open. I have a rose cut glass window that came out of the Clifton’s restaurant in West Covina. I’m am trying to get any information on it as possible. ie: circa, designer ect. Any help would be appreciated. photo is avail to email if needed. Big Basin Redwoods is the first California state park, not a national park. And, while the Clinton family might have some solid civil rights credentials, the SF Clinton’s Cafe mentioned was the site of a gay revolt of sorts, 3 years before the more famous Stonewall Riot in 1969, now considered the touchstone of the gay rights movement. When IS this place going to reopen? Has the scaffolding come down from the facade—is it, at least, fully restored? Can’t wait! I’m looking for the name of a cafeteria that was in Santa Monica, CA around 1980-85. It was located on Ocean Avenue, around California street, overlooking the Palisades and the beach. I think it was a French firm (since I saw a duplicate once in Paris). It had patio dining. Any thoughts on the name? A couple of years before he died, my father-in-law wanted all of us to go for a meal at Clifton’s; despite having grown up in Pasadena, he’d never been there because his mother was a snob who believed that poor people were simply shiftless and lazy, and was outraged that this place was handing out free meals to “bums”! But his daughter and I had tried it and loved it, so we loaded Mom and Dad into the car one Saturday and went down there. If the quality of the food had degenerated as the article suggests, we found no proof of that. My plate of braised short ribs with real mashed (NOT whipped) potatoes and green beans was as good as I’d ever eaten, and everyone else was pleased as well. Nobody was happier than Dad, though – he always paid for our communal meals, but was still (let’s say) careful with his money, and the smile on his face when he got past the cash register was wonderful to behold! I was thrilled to hear that Clifton’s Brookdale will be reopened. Many years back I’d heard that it was closed and was so disappointed that I would never be able to go back there, or to introduce my children and grandchildren to this wonderful cafeteria. Apparently I was misinformed, and it was actually closed much more recently than I thought. Is there any current info on an opening date? I can’t wait! While at UCLA in the very late 1950s, I worked in a Beverly Hills art store (Duncan Vail) with a young guy named Bill Tangeman whose father was the organist at the Brookdale. While he played, the caged canaries sang! I hope the canaries will be back. 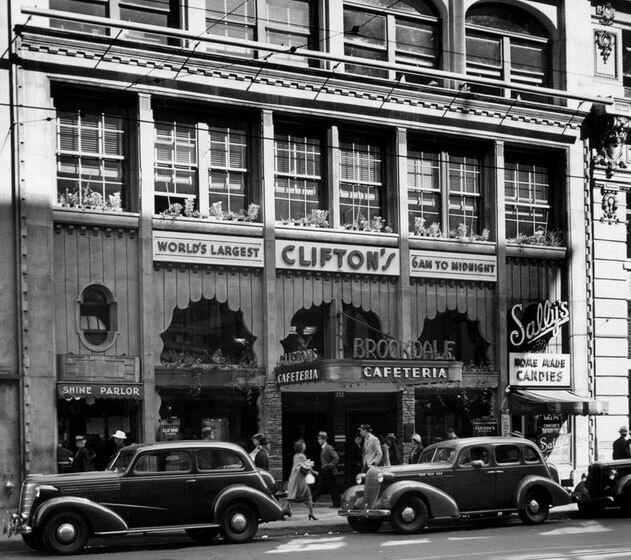 As a child, we’d go to a Clifton’s after the “Young People’s Concerts” at the old Philharmonic Hall across the street from the north side of Pershing Square. I particularly loved the “Pacific” one with the thatched roof cabanas and rain and thunderstorms every twenty minutes! And what’s not to like about a fountain that spouts limeade? I also remember mint water (?) coming out of a grotto wall at one of them. It was the 1940s and I was very young! I am looking for the old Mac n Cheese receipe. That one was a family favorite. Is there a site with receipes? You stated you had all the recipes. Any chance you would share that with me via email? Would love that wonderful enchilada recipe. I remember eating there when I was 16, working at Kay Jewelers. There was a May Company as well at Eastland Mall. What great memories. I would absolutely love to make those. I am now 65. It’s on my bucket list.